Drape this trendy garland anywhere to add height to your party and get your guests dancing! Just Dance Banner. Add a sparkling touch to your party celebration! TraditionalChristmas Bunting. Each pennant is approx. 18cm x 14cm at the widest points. Each flag has pre-cut holes for you to thread them onto the 3m of burgundy red organza ribbon (supplied). Traditional Santa image on an aged background with Christmas floral trims. Quality handmade Christmas mini bunting. Perfect to hang round a mirror or to add a splash of colour to a room. Green stars/beige reindeer fabric. Double sided (two pieces of fabric sewn together). Handmade with care. TraditionalChristmas Greetings Bunting. Each pennant is approx. 18cm x 12.2cm at the widest points. Each flag has pre-cut holes for you to thread them onto the 3m of red organza ribbon (supplied). Completed ribbon length is 150cm and the banners hang 14cm, all sizes approx. as it is hand made. Flags are 100% cotton fabric, single ply. 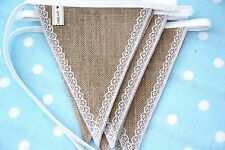 "Rustic Holly" Shades of Green & Hessian Fabric Bunting. Bunting is single sided and pinked on edges. Each length is 3m long (Approx 10ft ) with 10 flags per 3m strip. If you buy more than one 3m length and would like it as one long piece. Each pennant is approx. 18cm x 14cm at the widest points. Each flag has pre-cut holes for you to thread them onto the 3m of organza ribbon (supplied). We are always happy to help. Each pennant is approx. 18cm x 14cm at the widest points. Each flag has pre-cut holes for you to thread them onto the 3m of white organza ribbon supplied. Quality handmade Christmas mini bunting. Perfect to hang round a mirror or to add a splash of colour to a room. Shiny silver foil snowflakes & blue swirls Garland. Snowflake Dangle. for more great ideas. ---Includes 1 plastic pennant flag banner decoration. ---Approximately 12ft / 3.65m in length. ---Features a cheerfully festive polka dot design. ---Perfect for Christmas and fantastic for any festive celebration. Each pennant is approx. 18cm x 14cm at the widest points. Each flag has pre-cut holes for you to thread them onto the 3m of cream organza ribbon (supplied). 4 with Santa making toys and 4 Christmas trees & toys, as pictured. Each pennant is approx. 18cm x 14cm at the widest points. Each flag has pre-cut holes for you to thread them onto the 3m of organza ribbon (supplied). Handmade fabric holly pattern bunting. Completed ribbon length is 150cm and the banners hang 14cm, all sizes approx. as it is hand made. Quality handmade Christmas mini bunting. Perfect to hang round a mirror or to add a splash of colour to a room. Red reindeer fabric. Double sided (two pieces of fabric sewn together). Handmade with care. "Festive Holly" Shades of Red & Green Fabric Bunting. Bunting is single sided and pinked on edges. Each length is 3m long (Approx 10ft ) with 10 flags per 3m strip. If you buy more than one 3m length and would like it as one long piece. Alice in Wonderland Christmas Bunting. You will receive 6 flags with Alice in Wonderland characters(2 of each character) and 6 'Have a Wonderland Christmas' flags. 'Have Wonderland Christmas'. Each pennant is approx. Gingerbread & Cupcakes Christmas Bunting. You will receive 5 flags with Gingerbread characters and 4 Cupcake flags. Each pennant is approx. 18cm x 13cm at the widest points. Each flag has pre-cut holes for you to thread them onto the 2.5m of white organza ribbon (supplied). Kawaii Cute Pink Christmas Bunting. Each pennant is approx. 18cm x 14cm at the widest points. Each flag has pre-cut holes for you to thread them onto the 3m of organza ribbon (supplied). Jolly Holly Christmas Bunting. Each pennant is approx. 18cm x 14cm at the widest points. Each flag has pre-cut holes for you to thread them onto the 3m of pale blue or white organza ribbon (supplied). Each pennant is approx. 18cm x 13cm at the widest points. Each flag has pre-cut holes for you to thread them onto the 2.5m of white organza ribbon (supplied). You will receive 6 flags of each of the 2 designs pictured, 12 flags in total. Christmas Snowman Bunting. Each pennant is approx. 18cm x 14cm at the widest points. Each flag has pre-cut holes for you to thread them onto the 3m of organza ribbon (supplied). We are always happy to help. Alice in Wonderland Christmas Bunting. You will receive 6 flags with Alice in Wonderland characters and 3 'We're Having a Wonderland Christmas' flags. 'Were Having a Wonderland Christmas'. Each pennant is approx. Christmas Santa, Snowman & Elves Bunting. Each pennant is approx. 18cm x 14cm at the widest points. Each flag has pre-cut holes for you to thread them onto the 3m of organza ribbon (supplied). Handmade fabric blue SNOWMAN pattern bunting. Completed ribbon length is 150cm and the banners hang 14cm, all sizes approx. as it is hand made.